Could an App Boost Your Conversion Rate? Blog » Conversion » Could an App Boost Your Conversion Rate? For many of us, hardly a day goes by that we’re not interacting with an app. From messaging to online shopping to just plain fun, apps have grown roots and seeped into our lives in ways we never could have imagined. For many companies, this kind of interaction signals greater brand awareness, engagement and customer retention. But is an app the right choice for every business? 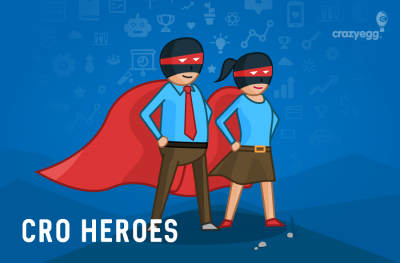 Read on to discover some unique ways that well-known brands are using apps to boost their conversion rates and reach new customers. If it’s one thing kids love, it’s superheroes. Cereal maker Kelloggs noticed that kids and their families were always in a rush at breakfast, so to help strengthen this vital part of the day, they called upon none other than Spider-Man. Through the use of an augmented reality app, kids could scan the Spider-Man art and download the app to mom’s smart phone to access exclusive movie clips. This, in turn, created more viral chatter on YouTube as well as other social networks. 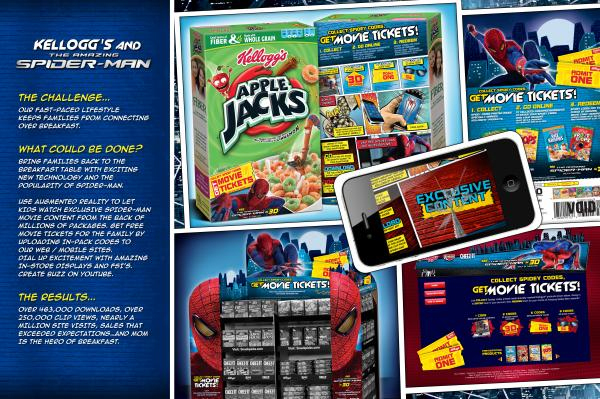 With over 250,000 active participants, it’s safe to say that the app, along with merchandising and related tie-ins, was a resounding success for Kelloggs. The campaign exceeded all expectations in terms of sales lift, ROI, and display. Key Takeaway: Even when you’re promoting something as commonplace as breakfast cereal, it pays to connect with the same figures that people admire (even if those people are 3 feet tall) to create the kind of atmosphere that generates feelings of comfort and togetherness, and reflects those feelings back onto your own brand. 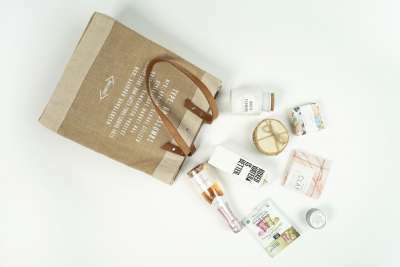 By previewing bags and then swiping those you like versus those you don’t, eBags not only lets you personalize your shopping, but they also gain valuable information about you as a shopper as you browse. Your browsing and buying habits are exactly the information any serious e-commerce company would love to have, and eBags is doing a great job of getting it with this app. Of course, they’re keen on making this feature as interactive and unobtrusive as possible. With over 100 individual “judging” factors in its algorithm, the more shoppers using the app, the more it learns about their likes and dislikes, eventually showing only bags it thinks they would like. Users can also filter the results by color or style. The results were astounding. On August 5th, the app was tested with 100 consumers. According to the study, the average user swiped a heart (love) or an X (dislike) a total of 76 times. On average, 14 swipes were hearts, and 62 were X’es. 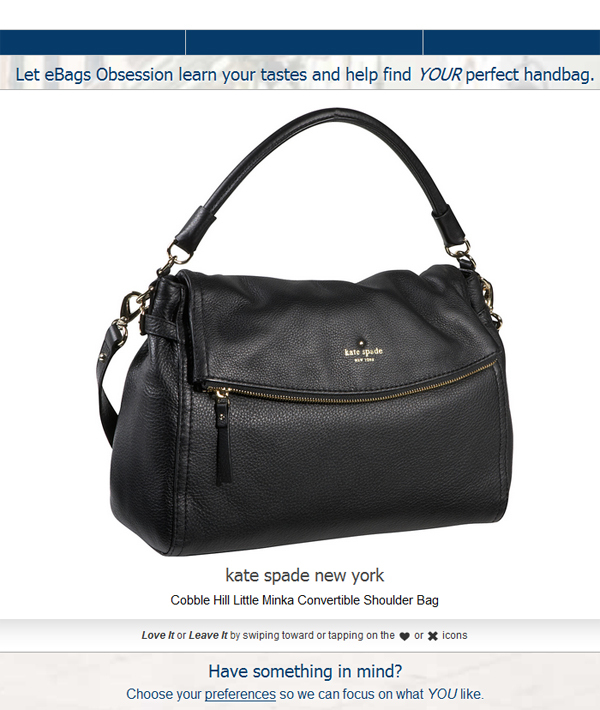 Perhaps most significantly, 10% of consumers who used the app ultimately purchased a handbag from eBags; a 10% conversion rate after just two days. That’s well beyond the estimated conversion rate from eBags’ general mobile app, which is 1.4%. Key Takeaway: If you can find a way to duplicate the general functionality of a specific app, but apply those same mechanics to your business, users will start to get involved. Love it or hate it, gamification of e-commerce products is rapidly approaching critical mass. Expect to see even more companies taking advantage of this trend as smartphones become even smarter, and data and bandwidth charges drop. We smartphone users have no problem swiping through product categories and zooming in on displays, but when it comes to ordering online, we’re all thumbs. That’s because the majority of mobile e-commerce is still in its infancy, relying on clunky “bolt-on” systems that were not built for, nor designed to accommodate, mobile users. Enter office and industrial supply shop W. W. Grainger. Because its customers are often out in the field doing site work, they don’t always have access to a PC. “With the help of the mobile app, a mechanic or maintenance worker in the field can quickly find the exact MRO product he needs, such as the right type of replacement light bulb. Many products in the app are pre-authorized for purchase, and, if necessary, the app enables personnel in the field to send more specific purchasing information to a manager with purchasing authority before completing the transaction. The results so far have been pretty spectacular. 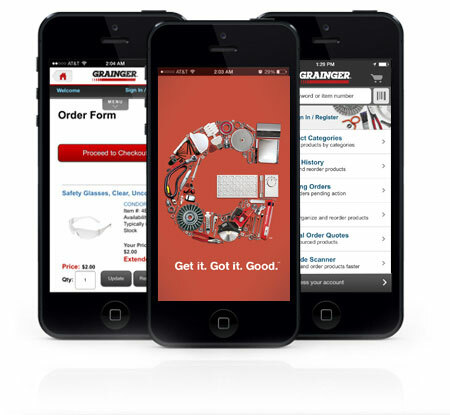 Today, the app accounts for 40% or $23.4 million dollars of Grainger’s sales, and that number is expected to hit 60 to 70% as more users adopt smart phones for quick orders on specific projects. Key Takeaway: Look for ways to shortcut the purchasing process, such as making the authorization process easier and faster. 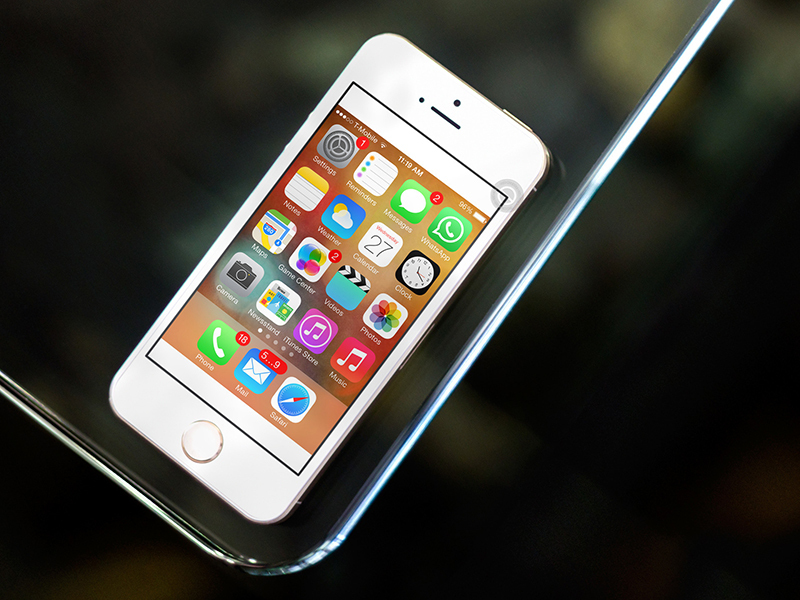 Mobile phone users won’t stick around to deal with a bulky e-commerce system. Make sure yours is not only responsive, but fast-loading and smart about a customers’ previous purchases and browsing history where possible. Crowd-sourced tee design shop Threadless has been popular for years, putting fresh new artists in the spotlight and making it easy to order custom-designed tees online. Now, they’ve taken the elements that made them famous and poured them into an iOS app. 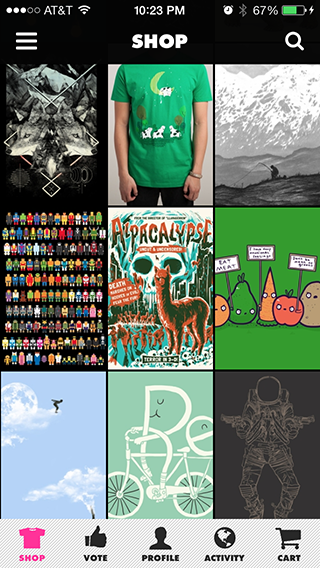 The release of the Threadless app is still too new to share any numbers, but users are already heavily participating in the simple voting structure, highlighting their favorite artists and discovering new tees through a scrolling feed. Key Takeaway: When crafting your app, never forget what features have made your site popular in the first place. If you can streamline those same benefits into an on-the-go version that makes it even easier for your audience to interact with you, so much the better. So Is an App the Best Choice for Your Business? As you’ve seen from these stories, there’s no doubt that a solid app can lend both credibility and convenience to your ad and branding campaigns. Done well, an app can add a layer of fun, entertainment or simply ease of use to an existing business model. What are your thoughts? Do you think branded apps are just a fad, or are they here to stay? Share your perspectives with us in the comments below, and if you’ve tried a branded app, we’d love to hear your experience about it as well!